KANSAS CITY, Mo. — Sundays during football are very apparent in Kansas City. Chiefs jerseys drape the statues and red flags wave throughout the kingdom. The 2018 season brought a new excitement. Fans are in awe at second-year quarterback Patrick Mahomes, the high-powered offense and the chance at a championship year. An ocean away, one woman is always aware of when the Chiefs are in action. Not necessary because of her fandom, sharing a name with one of the outside linebackers makes Chiefs news difficult to ignore. Uh oh. Is there a game on? Dee Ford, the surveyor—from Kent, England, now living in Gillingham—has been on Twitter since 2008. Her handle is @dee_ford , very similar to Chiefs linebacker Dee Ford’s former handle, @dee_ford_. “I’ve had the handle for about five years, long before I had even heard of American football,” she said. The mention madness began while football player Dee Ford was still playing for Auburn University. “I kept getting messages on my phone in the middle of the night and I kept telling people, ‘It’s not me, it’s not me.’ The more I got messages, the more people didn't believe that it wasn't me and it got incredibly worse when the athletic director at Auburn University tweeted to congratulate me on being MVP at, I don’t know, one or two o’clock in the morning,” Ms. Ford said. As the football Ford’s name became more known, Ms. Ford’s Twitter account gained in popularity. She began to approach the mentions with humor. “It just got easier just to join in and take the mickey out of people because nobody understood what was going on and it just became funny,” she said. Her notifications went through the roof once football Ford became a Chiefs player. The Dee Ford/Dee Ford, mix-up has made Ms. Ford a football fan. She bought a dummy’s guide to American football and began watching the college games. “I’ve kind of learned what happens and I understand it more now. I’m no expert by any means and I still have to ask some daft questions sometimes to understand what is going on,” she said. She’s a tigers fan and has made several friends in the Auburn community. 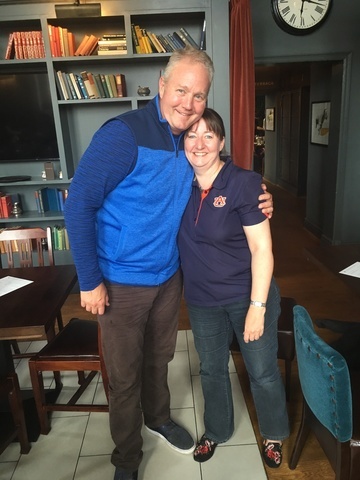 Former Auburn AD Jay Jacobs has even paid her a visit in London. When the Chiefs played in London in 2015, Ms. Ford and her nephew traveled to watch the team at Wembley Stadium -- meeting the other Dee Ford’s family. Dee Ford with former Auburn AD Jay Jacobs (Courtesy of Dee Ford). There are times when Chiefs fans are critical of football Ford’s play, but Ms. Ford has pleasant interactions online. Ms. Ford hopes that Ford’s groin gets better soon, and looks forward to the day when she can come to the US and watch Auburn and the Chiefs in person. Correction: In an earlier addition of this story, it was written that Ms. Ford was a war eagle fan. It has been changed to tigers, Auburn's official mascot.